When you’re ready to add an engaging element to your company’s grand opening ceremony, steel drum music is the best way to do it. 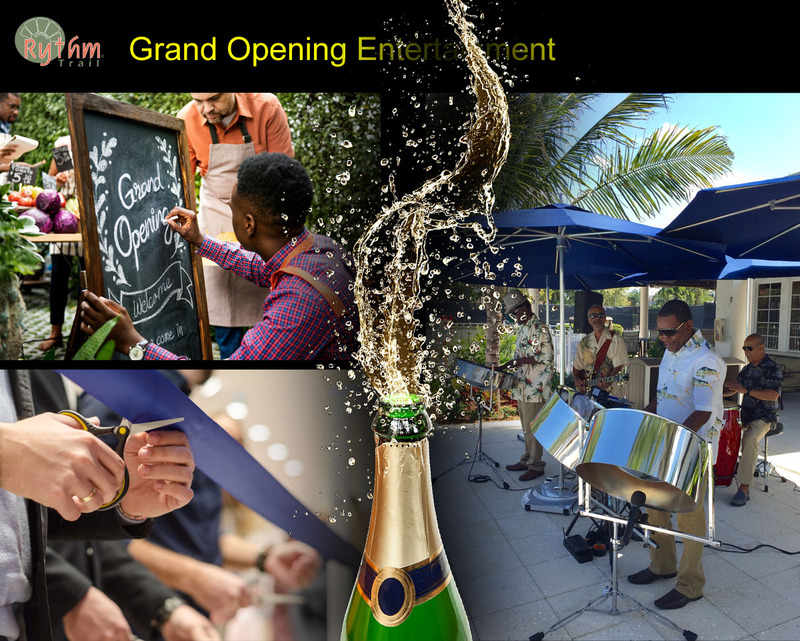 The upbeat Caribbean rhythms of a steel drum band will turn an ordinary ribbon-cutting ceremony or open house into an event that people will enjoy and tell their friends and colleagues about in the days and weeks to come. RythmTrail is Florida’s premier steel drum band—experienced and professional, with a music catalog that spans Calypso and soca to pop and reggae tunes. We have over 20 years of experience in Florida, playing at corporate and private events. From the moment your guests arrive until the close of your celebration, the steel drum sounds of RythmTrail will entertain and delight attendees, creating a unique experience that will be remembered and even imitated. Set the standard in your industry by bringing the sweet sounds of steel drum music to the gala you’re planning. With RythmTrail, you don’t have to worry about a thing. We’ll provide the tempo, at just the right volume, throughout the occasion. Call us or drop us a line today to discuss how we can provide the very best in steel drum music at your upcoming corporate affair. We look forward to hearing from you! Our Steel Drum Band performs at beach weddings, weddings, birthday parties, anniversaries, reunions, corporate functions, rehearsal dinners, grand openings and more. Hire the best steel drum players in Florida today.